What is the Best Garage Door Opener? Has your garage door opener finally given out? Instead of automatically replacing it with a newer version from the same brand, you might be interested in comparing different options to help you find the best garage door opener for your Florida home. Because everyone’s needs differ, garage door openers are not one-size-fits-all. Many brands and models will get the job done, but your final selection should be based on the style and weight of your garage door, any safety and security concerns you have, smart home compatibility requirements, and other desired features. Here, we’ll help you sift through the most important qualities of a garage door opener so you know what to shop for. Most single- or double-car garage doors made of steel or aluminum pair well with a 1/2 horsepower opener. If your garage door is oversized or made of heavy wood, consider a 3/4 to 2-horsepower model. The simplest way to determine what horsepower you need to lift your garage door is to check your existing unit. If this opener worked well for many years, buy a replacement with the same horsepower. If it struggled to lift your door or failed prematurely, upgrade to a higher-power unit, especially if your existing one is a 1/3 horsepower model. 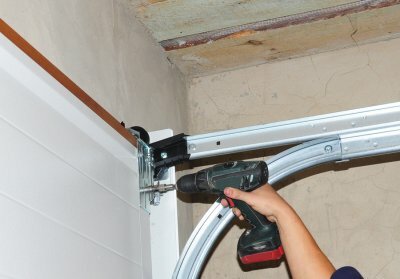 There are three primary types of garage door lift systems – chain, belt and screw – plus two newer options introduced in recent years called direct drive and jackshaft. If budget is your top priority, a chain-driven opener is the best choice for you. If you’re concerned about noise, consider a belt-driven opener. For low maintenance, a screw-driven system is your best bet. As for top performance and durability, direct drive and jackshaft lift systems are best, although these cost more than their traditional chain, belt and screw counterparts. The lift system you choose has a significant impact on how loudly your garage door opener operates, but this isn’t the only factor to consider. The best garage door openers feature motor vibration isolation to help eliminate unwanted noise. If your home has a bedroom, nursery or other living space above the garage, vibration isolation can help reduce the disruption of opening and closing the garage door. The average garage door opens at a rate of seven inches per second. If you want yours to move faster than this, look for an opener with a higher operating speed. If the opening rate doesn’t matter to you, a slower speed may help reduce wear and tear over time. Be aware that an opener’s speed rating doesn’t indicate its quality. As you shop for the best garage door opener, you’ll find that different models run on AC or DC power. Both types plug into a standard power outlet and operate seemingly the same. However, DC models tend to be smaller and quieter and have softer stops and starts. You also need a DC-powered unit if you’re interested in battery operation. A high-end garage door opener with a backup battery can save you from getting stuck inside or outside your house during a power outage. This is not only convenient but can even be lifesaving if you have an emergency and must evacuate your home or get to the hospital during a blackout. Expect the ability to open and close your garage door up to 20 times on backup battery power. A vast majority of garage doors come with two primary safety features: infrared beam sensors and automatic reverse. These tell the door when an object lies in its path as it closes, at which point the door reverses directions to prevent an accident or injury. These sensors are only active on the close cycle. Garage doors are designed to protect your car and keep intruders out. Of course, this is only effective if the door is closed. In the hustle and bustle of daily life, it’s easy to accidentally leave the garage door wide open. That’s why timer-to-close is such a beneficial security feature. Models that offer this convenience allow you to go inside with your arms full – no need to come back out and close the garage door. It also eliminates the worry that someone could leave the garage door open on accident. Other security features, including rolling codes and lock mode, are more mainstream. Rolling codes make it virtually impossible for criminals to steal the code from your remote because it changes every time. Lock mode is useful when you leave town because it prevents remotes or keypads from opening the door. When you return home, you must enter the garage through the house and program the opener out of lock mode before you can use it normally again. Most garage door openers have two light bulbs: one in the front and one in the back to help illuminate every corner of the garage. These bulbs activate automatically when you open or close the garage door and remain on for a predetermined amount of time (usually 4.5 minutes). Motion sensor lights are another option. These come on automatically when you enter the garage or leave your car, eliminating the need to fumble around in the dark for a light switch. A less common safety feature is light activation when you cross the infrared beam. This is a popular feature amongst Florida homeowners who like to sit outside on summer evenings with the garage door open. 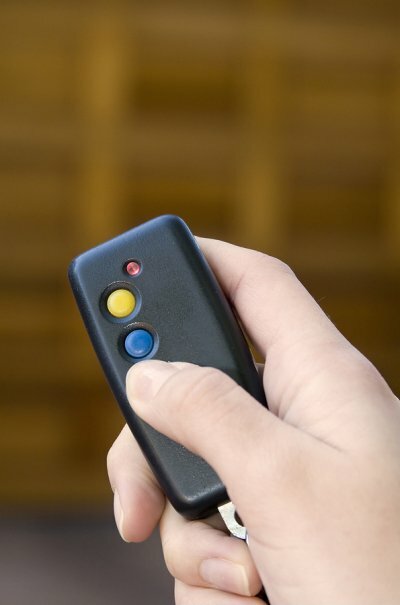 Most garage door openers come with two remotes, which are traditionally clipped to the visor in your car. If you have an in-car remote system, such as HomeLink or Car2U, make sure you buy a compatible garage door opener. Then, you won’t need to keep the remotes in the car, which improves security. Keypads are another popular way to enter and exit the garage. All garage door openers come with a control panel to open and close the door from the inside, but not all come with a wireless outdoor keypad. This offers convenience when working in the yard or coming home on foot. You can even program a temporary PIN number for houseguests or maintenance workers. When comparing keypads, look for a flip cover to protect against the elements and a backlight for ease of use in low-light conditions. If you’re keen on a DIY installation, it’s helpful to select a garage door opener that’s easy to install. Features such as pre-programmed remotes, snap-lock rail systems, and online tech support and installation videos set some models apart from the rest. Of course, if you get stuck, you can always call in a professional for help with the installation. A high-end garage door opener with built-in Wi-Fi lets you monitor and control your garage door from anywhere. For peace of mind, you can set up activity notifications to receive alerts any time your garage door is opened, closed or left open. It’s even possible to establish customized schedules to automatically close the garage door at certain times. Built-in Wi-Fi also creates the opportunity for smart home connectivity. This makes it more convenient than ever to operate your garage door. For instance, you can coordinate your smart thermostat, locks and lights to react when your garage door opens and closes at certain times of the day, indicating that you’re either leaving or coming home. Check the compatibility of the garage door openers you’re considering with the type of smart home system you have. The final way to determine if you have found the best garage door opener is to assess the warranty coverage. There should be three categories: motor warranty, lift system warranty, and parts and accessories warranty. The motor is the most vital part of a garage door opener, so it should have the longest coverage. In fact, the best models have lifetime motor warranties. Lift systems are often covered for one to three years, though some manufacturers offer a lifetime warranty. If a lift system fails, it’s usually easy to replace it without buying a whole new opener. A parts and accessories warranty – which covers remotes, wall switches, keypads and other components – should last for one to five years. Whether you prefer a LiftMaster, Genie, Chamberlain, Craftsman, Linear or another brand of garage door opener, A1A Overhead Door Company can help. Tell us what your top priorities are from the list above, and we’ll match your needs with a model that will work flawlessly for you. For more information about garage door opener installation and other garage door services in Jacksonville, FL, please contact us at (904) 579-1123. What kind of motor drives your garage door? If you’ve got an older model, it’s probably a chain, belt, or screw driven opener. In recent years, the introduction of the residential jackshaft and direct-drive openers have changed things, though, including conventional wisdom regarding the standard options. How much do you know about these different options? Do you have a thorough enough understanding to know which one is best for you? As you’d expect, chain driven models involve a chain. It’s similar to a bicycle chain, and it pushes or pulls a trolley that connects it to a metal bar. This bar is called a J-arm, and it’s attached to the garage door. Chain-drive garage door openers are the most affordable in the industry, and they’re durable and long-lasting, but they also tend to be noisy. This may not be an issue unless you’ve got a bedroom over the garage. Belt-driven openers are very similar to chain-driven models. The difference is that they use a reinforced belt to push or pull the trolley, rather than a chain. The belts are made of different materials: typically fiberglass, polyurethane, or steel-reinforced rubber. These belt-driven openers are quieter than chain-driven openers, but just as reliable. In fact, with periodic maintenance, you can expect your belt-drive unit to last for many years with no problems. You do pay for the extra quiet because belt-driven openers tend to cost $30-$60 more than chain-driven units. If you are really interested in a quiet model, you might consider a direct drive unit. These are supposed to be the quietest type of garage door unit because the only moving part is the motor. An example of German innovation, they feature a motor that travels along a stationary chain embedded in an overhead rail. A J-arm connects the moving motor to the door. This type of unit costs about the same as a belt-driven model, and have lifetime warranties. Screw-openers feature a trolley that rides on a threaded-steel rod. A motor rotates the rod, and because this design has fewer moving parts than most, it’s supposed to require the least maintenance. Screw-driven openers encounter problems, however, in regions with large swings in temperature. They’re also noisier than belt-driven openers, though manufacturers of this kind of opener are working on these problems. Working in their favor is the fact that they’re among the speediest of openers, opening a garage door at 10 to 12 inches per second as opposed to the 6 to 8 inches of most doors. All garage door openers close doors more slowly than they open them, at about 7 inches per second, for safety. A jackshaft opener is different from other systems. This kind of system mounts on the wall beside the garage door and uses a system of pulleys and cables to turn the torsion bar and raise the garage door. Driven by a 24 volt DC motor, this type of system is reliable and quiet, and keeps the ceiling free for overhead storage. It’s also a good option for a garage with a high or low ceiling. This is the most expensive of the garage openers. 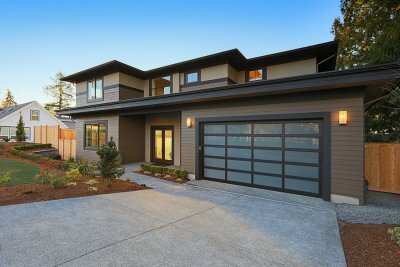 How do you know which type of garage door opener is right for your home? If budget is a priority, consider a chain-driven opener. These are also good for large, heavy garage doors, like oversized or solid wood doors. On the other hand, if your primary concern is noise, a belt-drive opener may be a better bet. Of course, if your door is noisy as it goes along the track, a quieter opener may be a moot point. If your budget permits a direct-drive or jackshaft model, you might want to go with one of these, because they’re quiet and extremely dependable. If you’re looking for a nice, solid, middle of the road option, consider a screw-drive opener. They’re not as quiet as belt driven or direct drives, but they’re quieter than chain drives. Be aware, though, that screw-driven openers require regular maintenance to keep the rod from stripping the teeth of the drive. Because of this tendency to wear out, they’re not the best option for large or heavy doors. Whether you need a new garage door opener, or you’re ready for a whole new garage door, contact A1A Overhead Doors Company today. Our knowledgeable staff can help you determine exactly what’s needed, and complete your installation efficiently and professionally. Family owned and operated, A1A Overhead Door serves the entire metro Jacksonville area. In fact, we even go up to fifty miles into the outer countries. We are licensed and insured to cover both the client’s property and ours, and we’re proud to work with our clientele and will match or beat any competitor’s written estimate. For more information, you can call 904.579.1123 or contact us through our website. One of the most important aspects of installing a new garage door on your property in Jacksonville, FL, is deciding what kind of garage door opener you want to use. There are several distinctive types of garage door openers on the market, each of which has its own advantages. Here is a quick introduction to some of the most popular garage door openers. If you’re looking for a garage door opener that is as unobtrusive as possible, you may want to go with a belt drive garage door opener. This type of garage door opener relies on a belt to put your garage door into motion, so it moves your door more quietly than an opener that utilizes a chain. If your garage is directly attached to your home, this may be the preferred option for you. It’s important to keep in mind, however, that these openers are pricier than chain drive garage door openers. 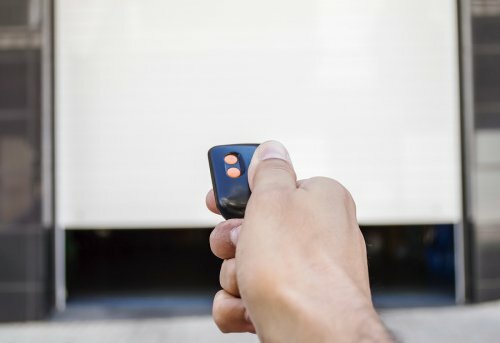 Perhaps the most popular type of garage door opener is the type that uses a chain. You’ve probably seen this kind of garage door opener in action before; it operates by using a trolley connected to a chain, which lifts and lowers your garage door. The motion of the chain does tend to make noise, which means that these openers are often used in garages that are not directly attached to houses. These garage door openers work very differently than those that use belts or chains. With a screw drive garage door opener, the trolley that moves the door up and down is moved by a rotating threaded steel rod. Screw drive garage door openers are designed to be simple in design and operation, so they don’t tend to break down as frequently as other types of garage door openers. They are noisy, which you should keep in mind when you’re deciding which type of opener is right for you. What Are the Most Common Reasons for Garage Door Spring Problems? Your garage door spring is designed to secure your door as it travels up and down its track. When your garage door spring is broken, you will have a serious safety issue on your hands. Rather than ignoring your broken spring, take the time to schedule garage door repairs with a team of garage door experts in Jacksonville . To help you identify when it is time to schedule repairs, here is a look at some of the most common reasons for garage door spring problems. 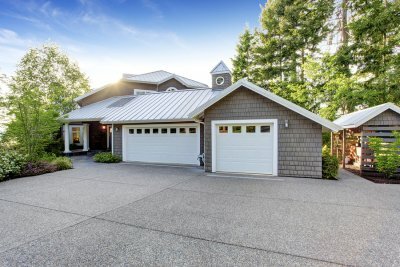 In order to ensure your safety, your garage door springs are connected to a set of safety cables. If the mechanism that holds the springs in place ends up failing, the safety cables will provide your door with an extra layer of support and stability. When these safety cables break, your garage door spring may fall out of position. By fixing your safety cables, you can restore functionality to your garage door spring. Garage door springs need to be balanced correctly in order to function properly. Over time, your springs may fall out of balance and prevent your garage door from opening and closing correctly. If you are able to maneuver your garage door manually, but are having trouble operating the opener, the issue could lie in the balance of your garage door springs. Neglecting to rebalance your springs could result in a serious safety issue for your garage door. A final cause of garage door spring issues is incorrect adjustment of the brackets that attach the springs to the end of the garage door panel. These brackets are designed to place a specific amount of pressure on your garage door springs. If you end up tampering with the brackets and changing their tension settings, you could wind up breaking your garage door spring. To adjust your garage door spring or brackets, always contact a garage door repair professional.